Man Utd reportedly remain concerned over whether or not Romelu Lukaku will be fit to face Watford after the international break. 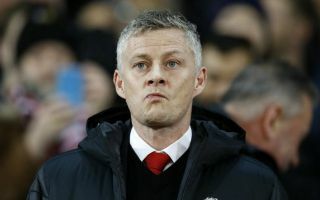 Ole Gunnar Solskjaer’s men have stumbled in recent weeks, losing to both Arsenal and Wolves as they risk losing their momentum under their interim boss. With that in mind, they’ll want to make a confident start to the run-in to end the campaign, with Champions League qualification a priority along with trying to eliminate Barcelona in the quarter-finals this time round. In order to do that, Solskjaer will be desperate to maintain as close to a fully fit squad as possible, but it doesn’t sound particularly promising for the Norwegian tactician. As reported by The Sun, Lukaku underwent a scan earlier this week on his foot injury, and is expected to sit out Belgium’s clash with Russia on Thursday. However, it’s added that he will have to prove his fitness on his return to Carrington next week in order to get the green light from the United medical staff. In turn, there will be an anxious wait as far as Man Utd are concerned as to when they learn if Lukaku will be available for selection against Watford on on March 30, with Sky Sports noting that fellow striker Marcus Rashford is also currently struggling with an injury issue of his own. Having both forwards ruled out against the Hornets will be a major blow for Solskjaer and the Red Devils, and so he’ll be hoping for good news this week with the fact that Lukaku won’t likely be risked undoubtedly music to their ears for now. After a stuttering season, the 25-year-old has been crucial in recent weeks, scoring six goals in his last four outings across all competitions. It’s a timely boost for United, but they’ll hope that he can continue that in the final stretch of the season as the battle for a top four finish goes on with the likes of Tottenham, Arsenal and Chelsea.